Broad consensus exists in the neurointerventional community in regard to the mechanisms by which dural fistulas induce harm. It is commonly accepted that the hazard of fistula is proportional to the degree of venous congestion it produces. The more congestion, the greater possibility of hemorrhage, edema, etc. This simple and powerful idea, reflected in the Cognard-Borden classification, has so far stood the test of time. However, there is currently no similar agreement — not even close — regarding various theories on the pathogenesis and angioarchitecture of these dural-based shunts. Some believe in existence of multiple shunts throughout the section of diseased dura, others hold that the shunt points are one or a few in most instances. The mechanisms responsible for formation and evolution of fistulas continue to be debated. Molecular biology and genetics have not, in my opinion, yet made a significant contribution to our understanding beyond the ubiquitous presence of all manner of molecules, proteins, and factors which are essentially found in every place where any vascular disease process takes place. Sometimes, however, very useful information can be learned from individual cases. 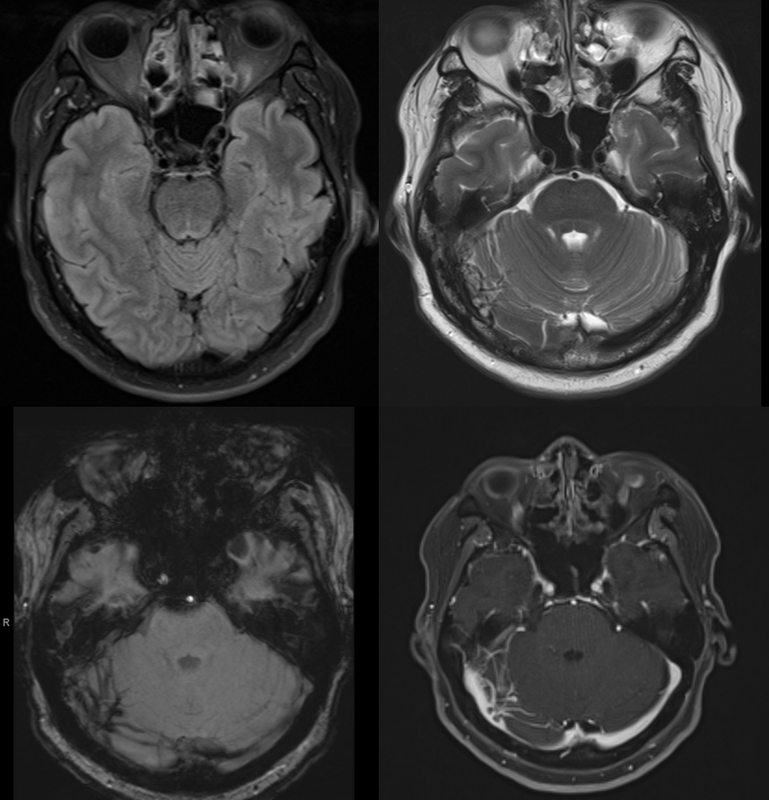 MRI suggests cerebellar venous congestion. Real or not? Angio. Check out that rotundum feeder. 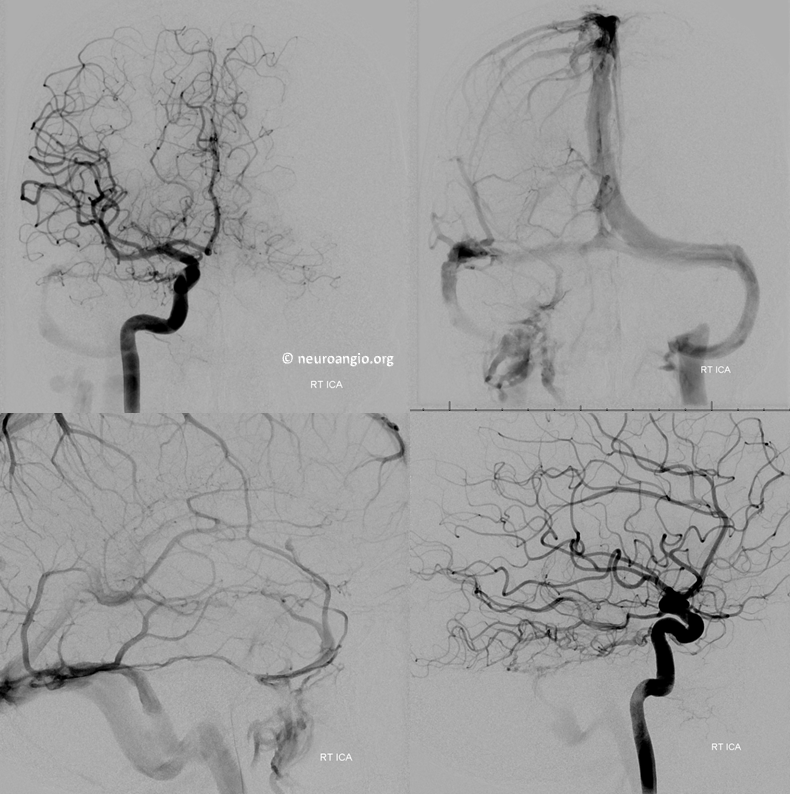 Posterior inferior temporal and PICA anastomoses with dural branches perfectly outline the arterial arcade of the transverse and sigmoid sinuses. These arteries in the walls of the sinuses parallel the course of the sinus as seen on the frontal view. The same is seen from the right. 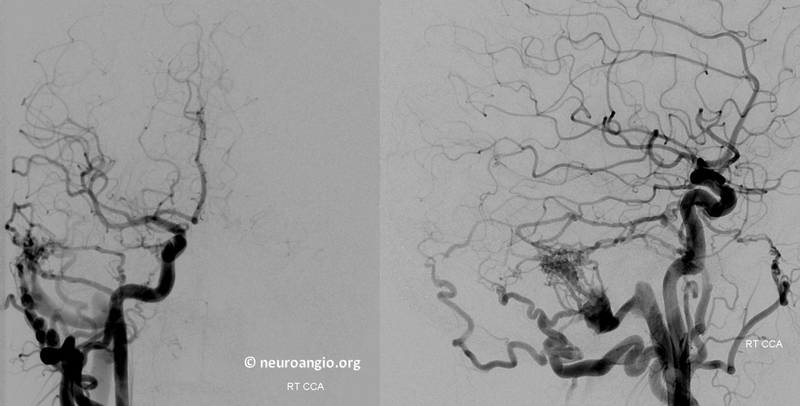 Of course, there is no cerebellar venous congestion. 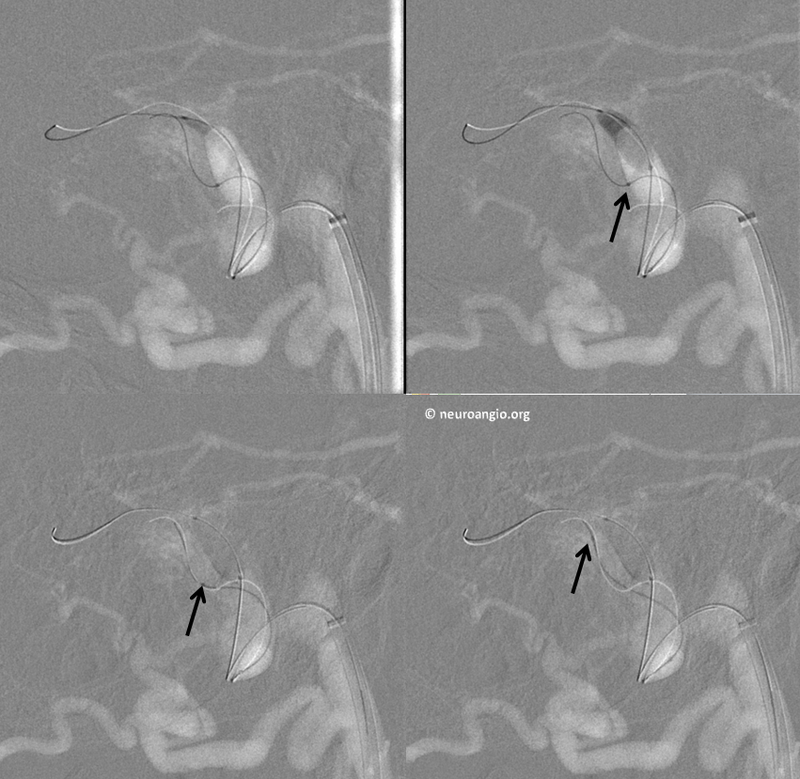 How often does one see posterior fossa venous congestion-related hemorrhage from a sigmoid sinus fistula? External injection. 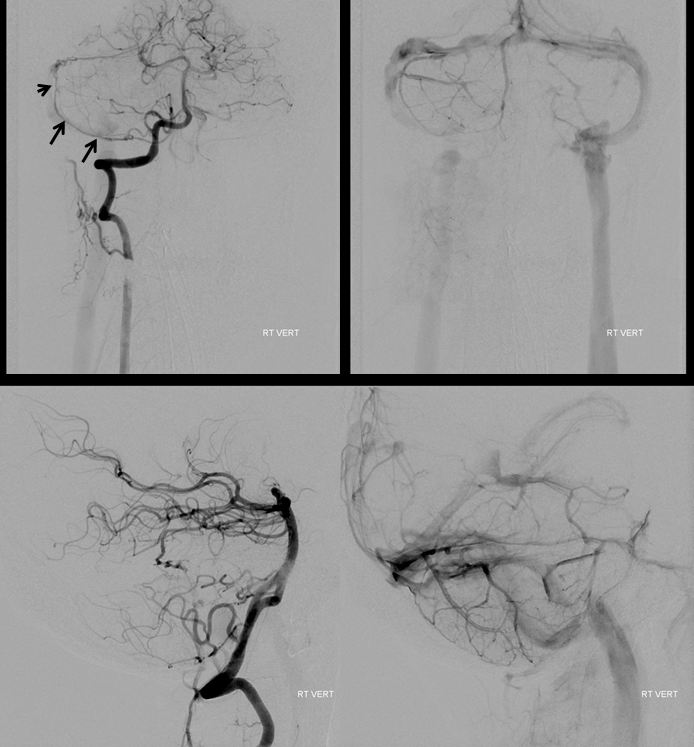 Notice recurrent meningeal variant (above) with the MMA here limited essentially to the petrosal branch. There is even a bit of foramen rotundum branch contributing. So far there does not seem to be anything too interesting about this fistula, right? Now, lets try to understand the fistula a bit better. Where exactly does the fistula communicate with the sinus proper? Are there many fistulous points or few? What can we do to define it? 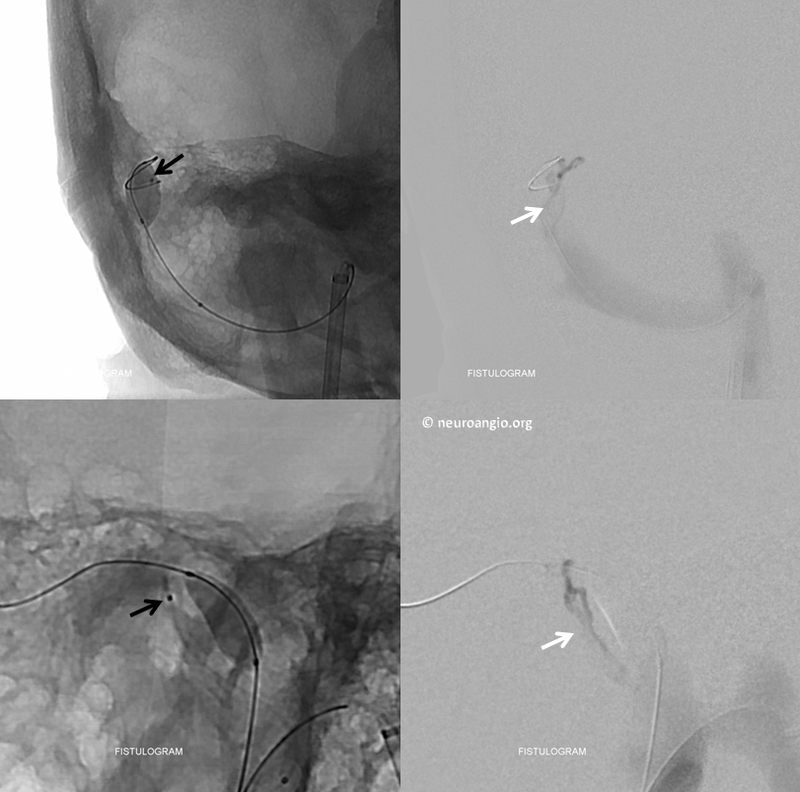 In this case, we inflate a balloon in the sigmoid sinus to partially block its outflow. 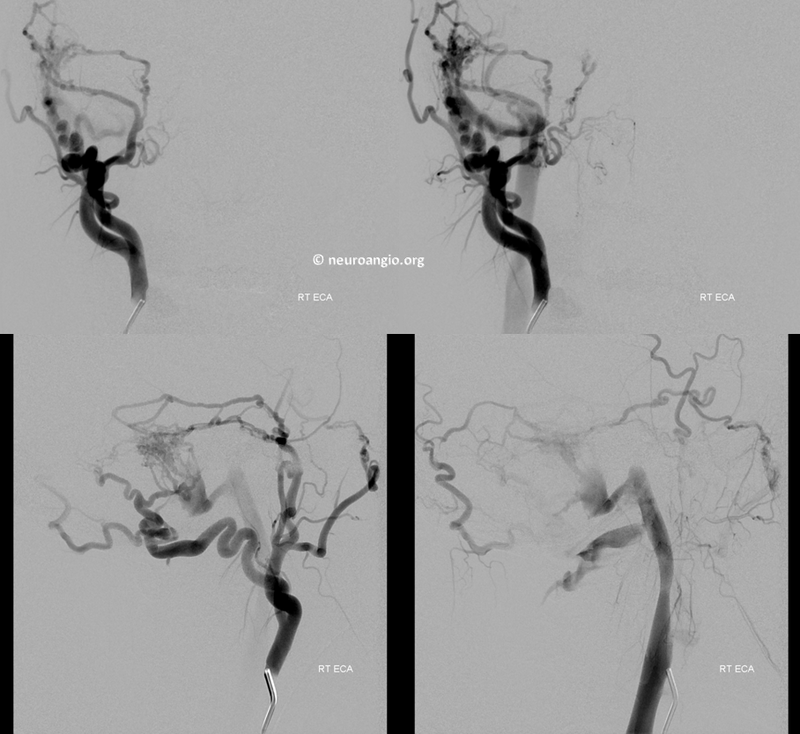 This slows down the arteriovenous transit time and allows us to better define the fistula angioarchitecture. Notice, for example, that a channel seems to be present (white arrow) below the sinus proper, which is identified by the balloon. This channel is not exactly in location of where the occipital and MMA appear to be converging, but rather more proximal. Nevertheless, it is an important finding. Now we make an assumption that this channel represents the common fistulous vessel upon which the myriad arterial feeders from the occipital and the MMA, lateral tentorial, etc converge. This common channel then empties into the sigmoid sinus. We proceed to catheterize this channels from the venous side, with the tip of the SL-10 shown by black arrow. 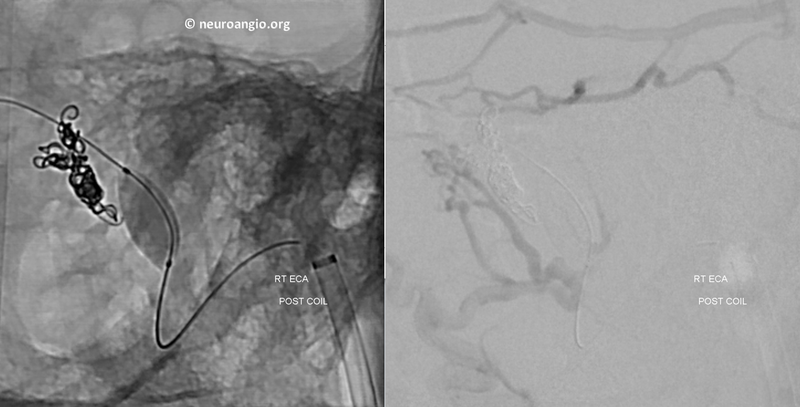 The balloon, which we moved somewhat distally, aids catheterization by preventing herniation of the SL-10 into the sigmoid sinus. 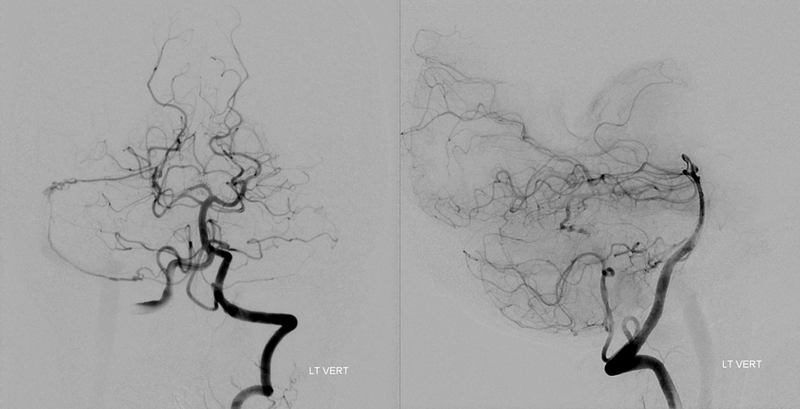 An injection of the SL-10 — a fistulogram — confirms that high flow is present within this channel. Magnified view with the white arrow pointing to the common channel. If the theory is correct, closing this channel should kill the whole fistula. Any embolic material is fine. We chose coils so as to maximize the illustrative power of this magic bullet approach. Guess what? 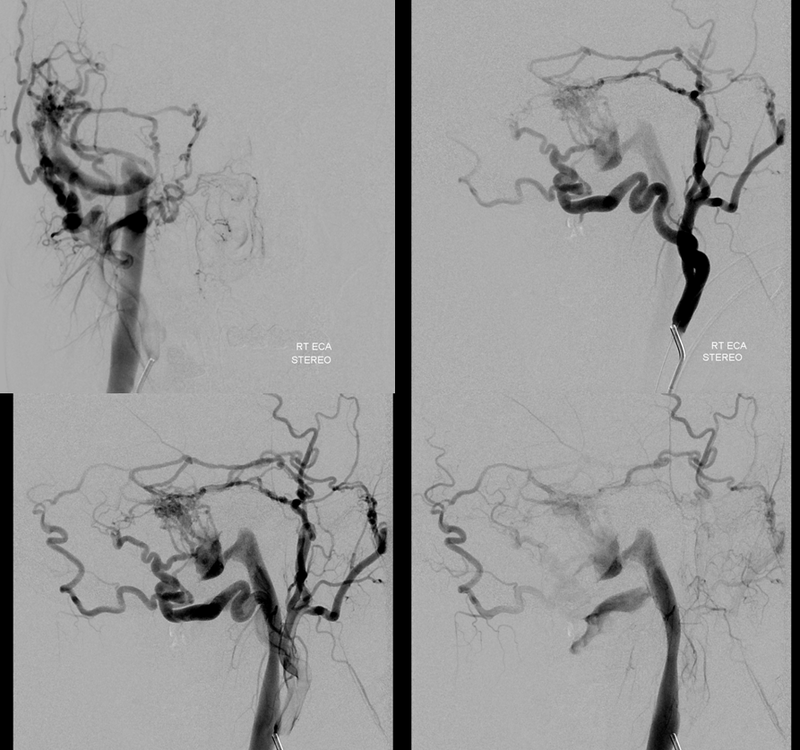 — no more fistula from the ECA injection — right-sided image. Control images after balloon deflation. No more AV shunting — the MMA and occipital are converging on a dead end channel. So, what have we learned from this case? From my perspective, we showed that this fistula is really a single hole connection between a common channel in the wall of the dural sinus and the sinus itself. The myriad tiny vessels from occipital, MMA, etc are just noise — the key is finding this channel and plugging it up. Are there other ways to kill this fistula — definitely, several other ways. Transarterial embo is one — but you’ve got to be a bit careful about the petrosal branch. Personally, i think that doing it carefully is quite safe, but not everyone agrees. 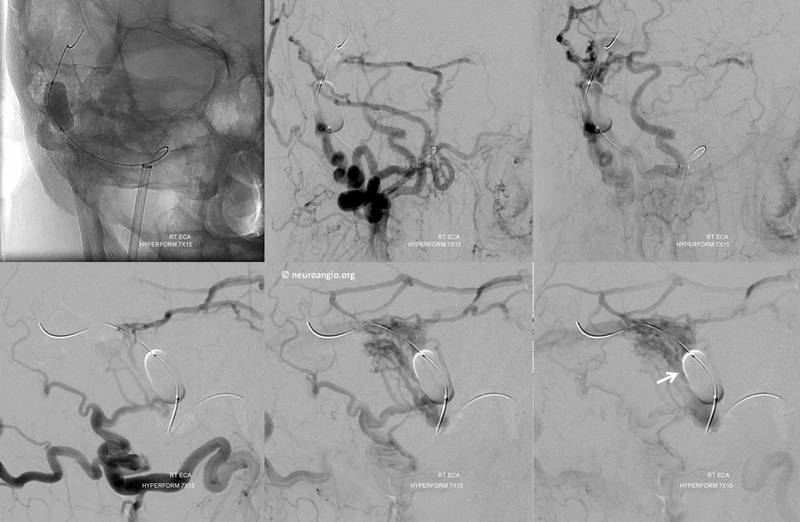 Transvenous with entire sigmoid sinus sacrifice is safe but unnecessary. 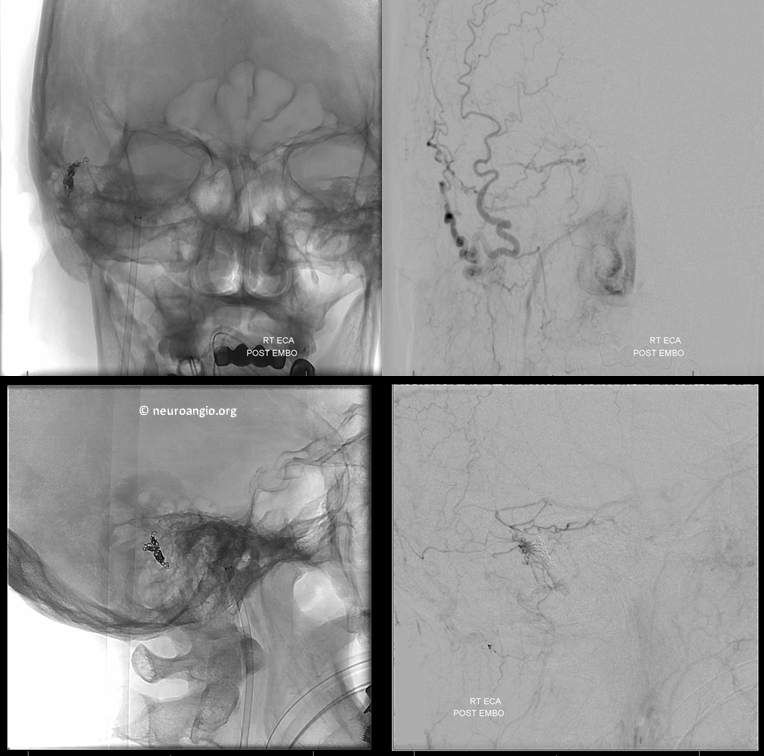 This superselective venous approach, in my view, is the optimal way — it combines the relative safety of venous side embolization with the advantage of preserving the sinus itself that is lost with a nonselective total sinus sacrifice. It does not always work, but it does work much more often than might appear at first glance. Piske RL, Campos CM, Chaves JB, et al. 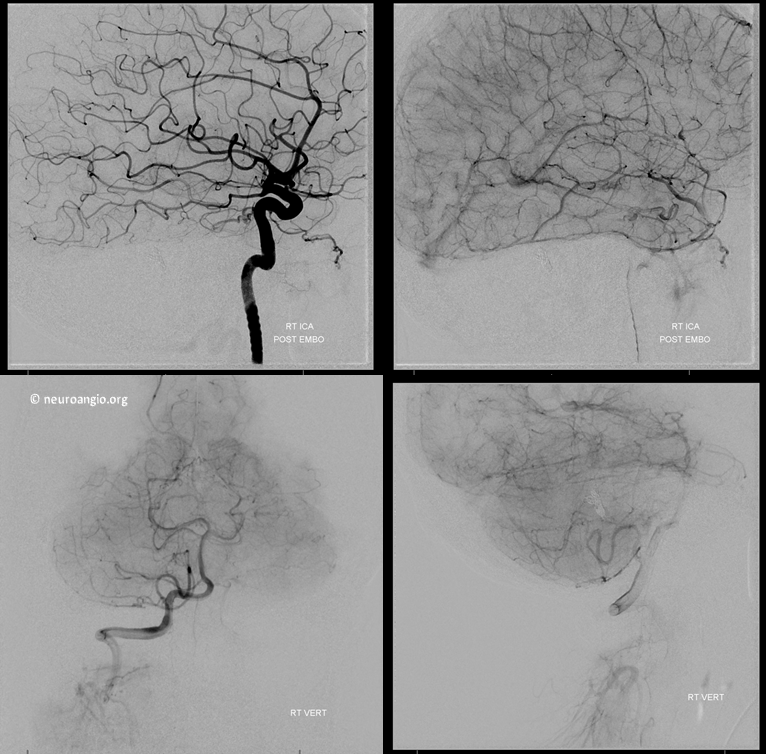 Dural sinus compartment in dural arteriovenous shunts: a new angioarchitectural feature allowing superselective transvenous dural sinus occlusion treatment.